There is something to be aware of while reading the different “Black Friday” sales advertisements, specifically those once in a lifetime, amazing computer and electronic deals that seem too good to be true. What happens often is that the greatest deals in the ads have less than 10 items in stock despite hundreds if not thousands of people visiting the store for those specific items. A lot of you Black Friday shopping veterans know exactly what I am talking about. [adblockingdetector id=”2″]Those of you who will be newbies during this coming Black Friday or have not been to many Black Friday’s might wonder, “Why would a store advertise an item for a great price and not have many of that item in stock?”. If an electronics store advertises a computer that they paid $1,000 for each unit and they advertise it for $99 why would they want to have an inventory of 10,000 of those in stock if they lose $901 during each sale? It does not matter if the customer purchases the extended warranties and extra peripherals to give them an extra $300-$400 in profit since they are still losing money. Obviously they want you to visit their store instead of a competitor and placing an extraordinary deal in the ad that blows away the competition even though they only have one in inventory is the way to do it. Is this legal? Yes, as long as they have at least one of those items in stock the day of the advertisement they can get away with it. Sometimes they will take a Polaroid of the person who purchased the item to prove they had it in stock. The only way to guarantee you will get that amazing, once in a lifetime deal is to be first or one of the first in line. The bad news is that the first few people always get in line the day before, during Thanksgiving. This can be anywhere from 8 to a full 24 hours. The information above is not to discourage you in any way from visiting your favorite retail store(s) during Black Friday. It is just to make you aware of what is likely to happen so you will not get discouraged when you arrive at the store 5 hours after it opened and hear that your item sold out 4 hours and 59 minutes ago. As long as you arrive at your chosen store(s) within the first hour it opens you should be able to get many things in the ad, just not the elite deals. If you are serious about getting at least some of the great deals in the Black Friday advertisement I would recommend arriving and getting in line at least 2 hours before the store opens. Good luck shopping during Black Friday! 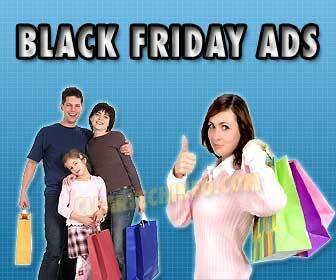 If you have a question on Black Friday or any of the advertised deals feel free to ask. Just comment below or ask in our forum.